I’ve been lucky to have two dedicated sewing spaces before my current one. But they never felt truly mine. I was never able to really use the area like I wanted. But now, I’ve been able to do as I choose in our house. I guess, when you own you don’t feel guilty over all the holes you put in the walls, or any changes you make to a space. My husband assumed I would go for the finished basement: a bigger space, convenient bathroom, and it’s quieter down there. But I knew if I set up shop on another floor I would rarely go to it. It’s a lot easier to spend most of my time wherever my son plays, and that’s usually in the living room. So I went for the dining room, which is next to the kitchen and living room. It’s a cozy space but the light in there is gorgeous. The only thing that needed changing was the paint color. So before we moved in we painted the living room and sewing room. We chose Benjamin Moore’s popular ‘Grey Owl’. I really love the cool feel it offers in both rooms. I’ve lucked out that the cutting table has survived two big moves. It’s made up of Ikea Lack tables; not the sturdiest of materials. I never posted anything about making this table because it was so straightforward. We used this tutorial, if you’re curious. The cubbies have proven invaluable in storing my stash. I’ve actually outgrown them! Must start producing more garments and acquiring less fabric *she laughs maniacally*. I’ve had to buy little cubes to store more fabric under the table. I love the baskets. They have proven quite useful. I’ve used them in the bathroom, baby’s room, kitchen, and now in my sewing room. For our wood (aka 5th) anniversary, Greg gifted me a ruler stand. It works great on the pegboard. It took up too much room on the cutting table. Mason jars have also proven to be a handy organizer for notions. And they are pretty to look at. The jewel cases are empty but they were a lovely gift from my mother-in-law. Also pretty to look at :). 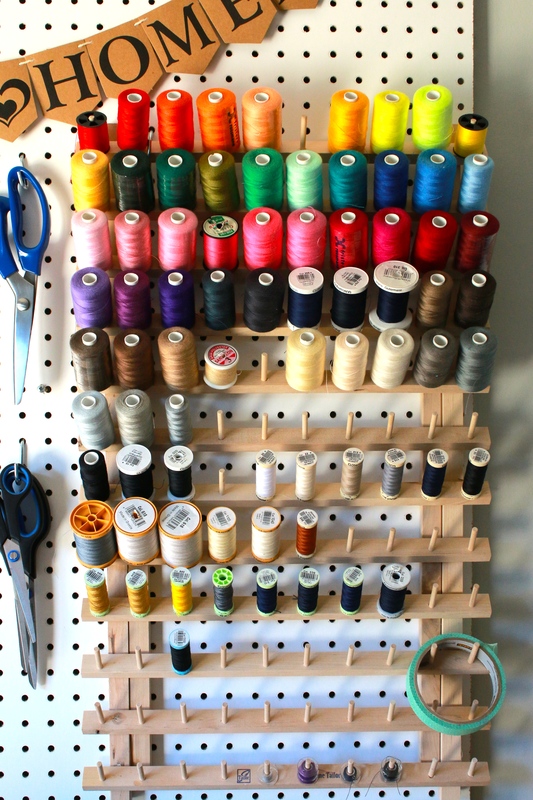 How lovely are colorful thread racks? One day it’ll be full of the good stuff, Gütermann thread. The room lacks any sort of built-in storage, which makes sense since it’s suppose to be a dining room. But nothing a bookcase can’t fix. Most of my notions, books, and knitting supplies are here. Some recent pieces I acquired for my room came from my local Buy Nothing group. Have you heard of it before? It’s a group where people gift items they no longer need. It’s also a place where people can go to if they are in search of something. Everything is given, no bartering or money is ever exchanged. And it helps you get to know your neighbors. I joined my local group on Facebook and I have given and received a lot. For instance, I picked up a wooden poster holder to store my Swedish tracing paper and leather. And a wooden filing cabinet to house my patterns. Having my computer next to my sewing stash has SERIOUSLY quelled my fabric buying tendencies. Well, mostly. I have bought some fabric to make O’s Halloween costume and baby girl’s fitted crib sheet. But it’s nice to be able to listen to music or watch videos while I’m sewing. So that’s my little happy sewing space. Lately I’ve been able to nip in for a few minutes here and there. And it’s been awesome. No need to wait for a nap or bedtime. O plays in the living room and I can have a bit of time to myself. The room leads to the yard so I also have the option of letting O play outside while I watch and sew from indoors. Bliss! 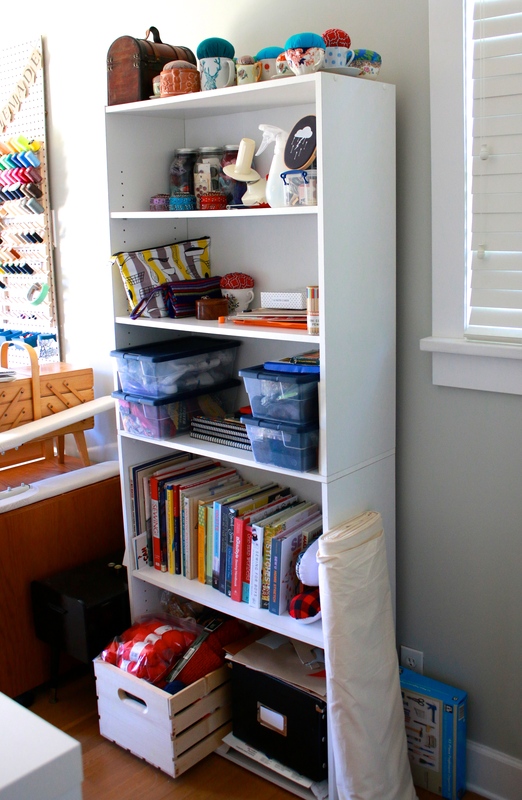 This entry was posted in sewing space and tagged sewing room, sewing space. Bookmark the permalink. So colorful and happy! Good that you have it finished before baby comes. Hopefully you’ll get to sneak some sewing time in here and there during her first few months. Thanks! It really is quite a happy space. Feels so clean…wish I could say that about the rest of the house at any given time…ha! I do hope I can sneak away while she’s still little. I bought us a wrap. I figured she will be worn a lot in and out of the house while we keep up with big brother. 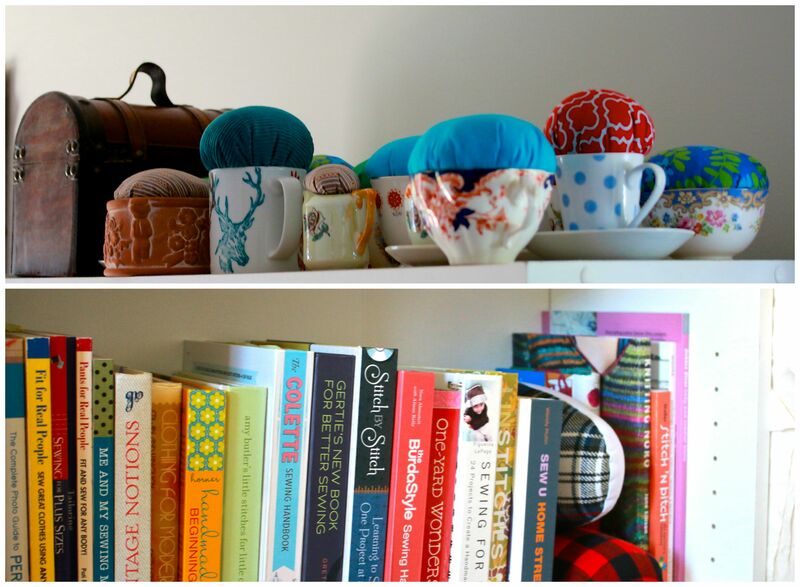 Your space is so pretty and organized! 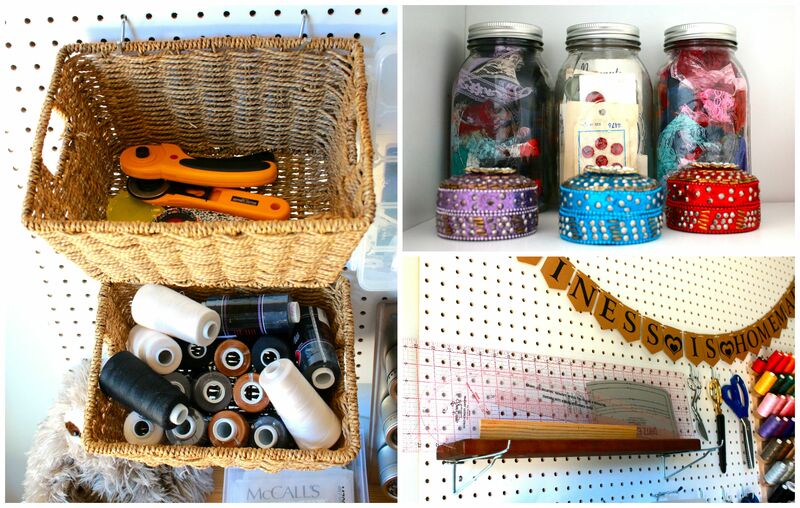 I love your pegboard idea. I’ve been struggling with how to better utilize some of the wall space in my sewing nook, and I think that hanging a pegboard is a better idea than making an IKEA run for more shelves. Thanks! For a quick second I thought the pegboard wouldn’t provide too much storage. But I went for it anyway because I love the look. Well it ended up putting a lot of the most often used tools and notions front and center. It’s nice not having to search for it in a box nearby. It’s so beautiful! And you took such amazing pictures of the space too! Can’t wait to visit it in person. You have to come over soon. We can prep some projects! Ok, that is quite the stash. But very well organized, and accessible, not hidden in bins like mine (out of sight, out of mind)! And I really like your tracing paper holding device. Enjoy your new space! Thank you! I think seeing the fabric will lead to inspiration, which is why I haven’t hung a curtain to keep the light away. I’m going to hope they just won’t fade too much. I wouldn’t have thought a poster rack existed until I saw it. It’s pretty cool. It’s lovely. Such a lot of light! And very well organised. Thanks! It came together really quickly, which surprised me. I was a bit paralyzed over putting it together because I wanted it to be perfect. But then I decided to just work with what I had and just add the pegboard. Made the process a lot less stressful. So it helped me to just do it! I hope you share your space once you’re done. You have such a great decorating eye! 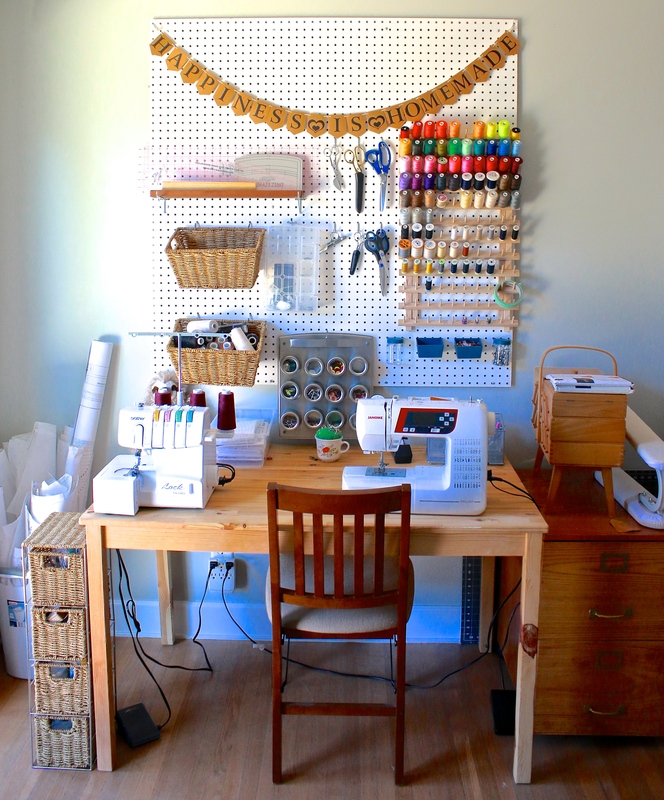 What a beautiful sewing space you have created! I love the illustration above your monitor! Here’s to many happy years of sewing in your wonderful new space! Aren’t husbands just handy? 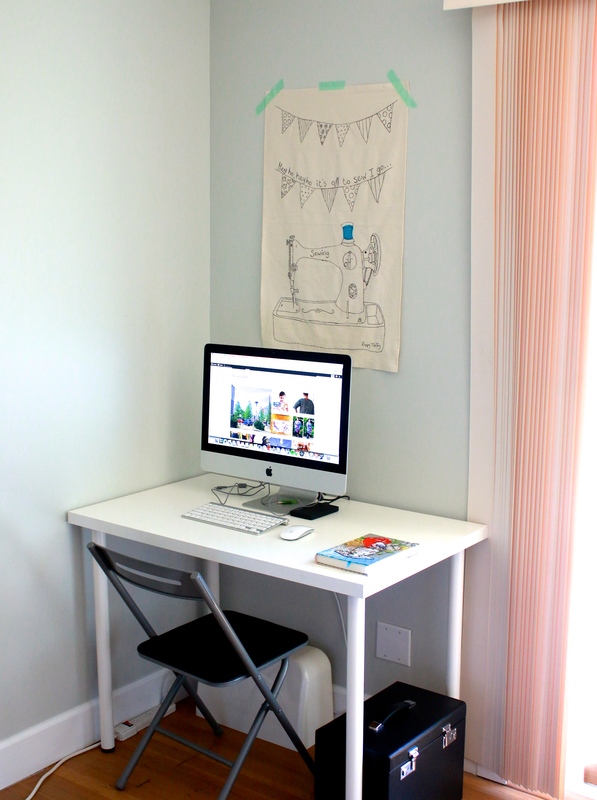 Your sewing space is amazing! I love your space! 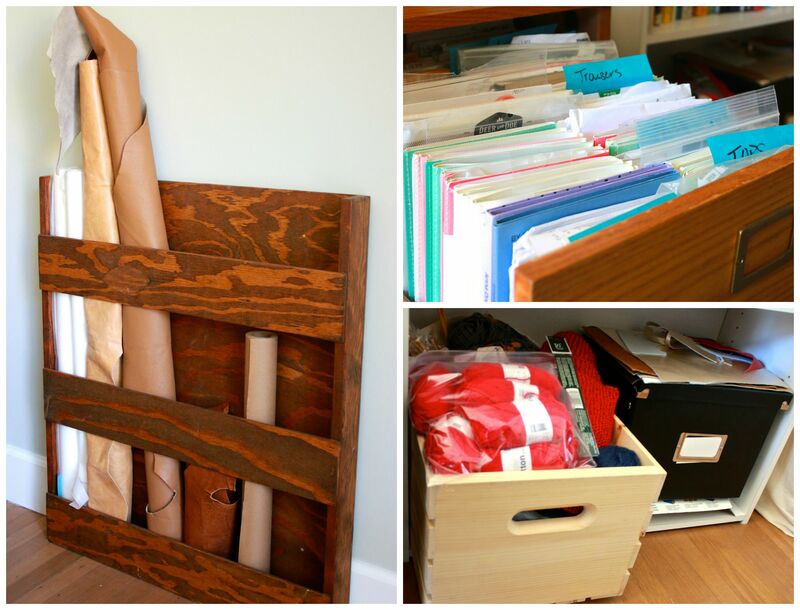 It’s fantastic and looks really neat and organized! I’m excited to see what you create there! Thank you! Having all my tools in plain sight has made sewing a lot more relaxing and fun. I echo the sentiments that it’s a lovely space. I’m sure you’ll make many a happy memory there. Love all the pincushions! Thank you! I made those pincushions using cups I bought at charity shops in London. I love them. 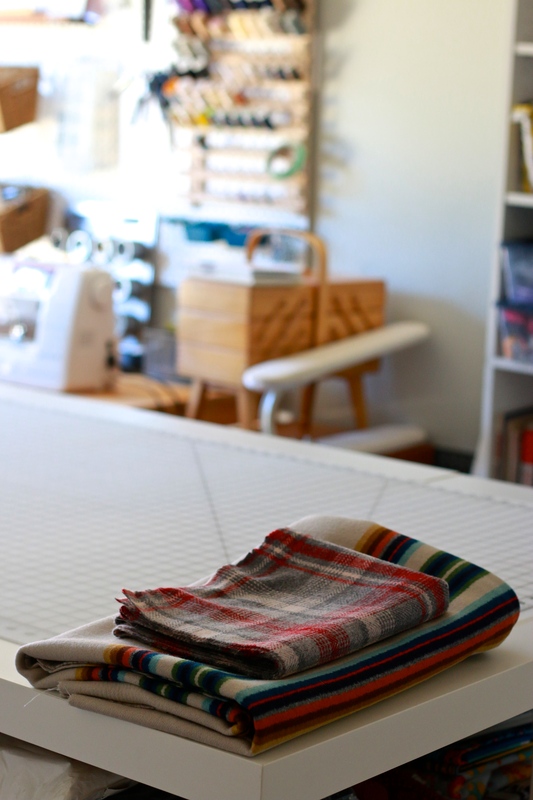 Your sewing space is beautiful! Thank you. Very happy it came together mostly easily. 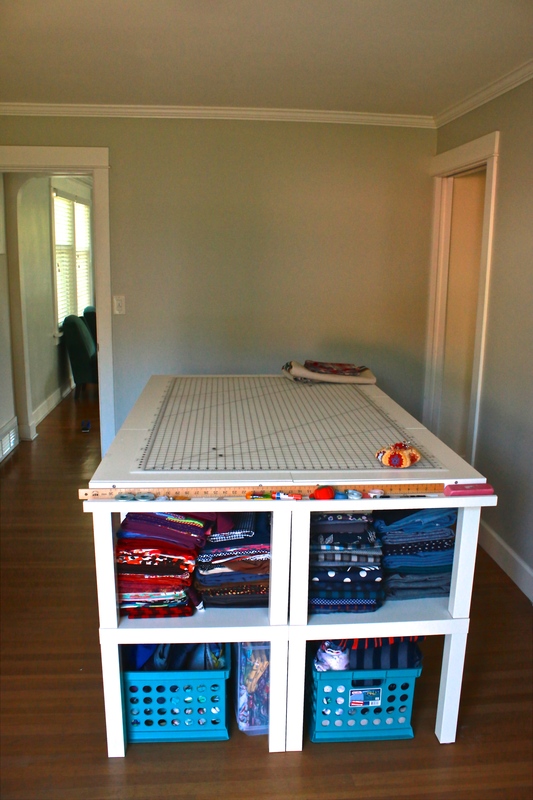 what a gorgeous sewing space! I too love that poster rack, and the woodenfiling cabinet. We used our local freecycle group when we moved to our new house, more for getting rid of stuff but it was great to know it was going to a new home. I wish I oculd have all my fabrics out like that as I keep forgetting what I have – but with my sewing space being in the hall I know they’d just get pulled out all the time by small hands! Thank you! I imagine when my daughter is crawling I’ll have to shut her out. I can picture a baby being rained by stacks of fabric. Ha. Such a pretty space. I love all the light!! What a wonderful space! It’s so bright and organized! 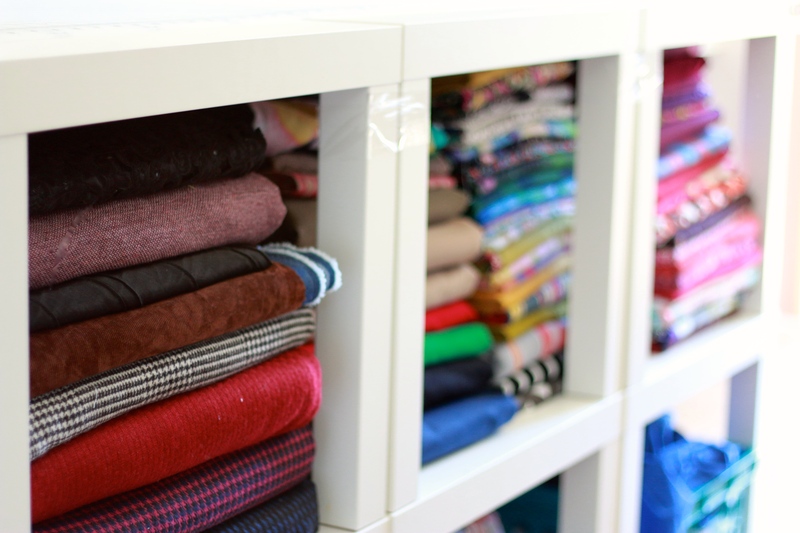 I’m struggling to organize my workspace better these days… as I’ve been taking on more sewing projects on the side for extra cash, it’s been hard to keep the clutter from being too overwhelming! And as a renter, like you said, holes in the wall are no bueno. But I’m so glad to see what you’ve done with your space- it always sparks my imagination to see how other people utilize their spaces! Thank you! Getting things in order can be overwhelming. I hope you find a method (or few) that help keep things tidy. I used a lot of the things I already owned, which was a nice and inexpensive way to decorate. PS I looooooooove the stripey fabric in the first photo… what are you planning to make with it??? I was thinking of a Moss skirt? Maybe? I’m totally open to ideas! What a fantastic space! Congratulations! Thank you! Feels really nice to work in it. What a lovely space, It looks so light and calm! It’s definitely both of those. It’s quite the happy space.